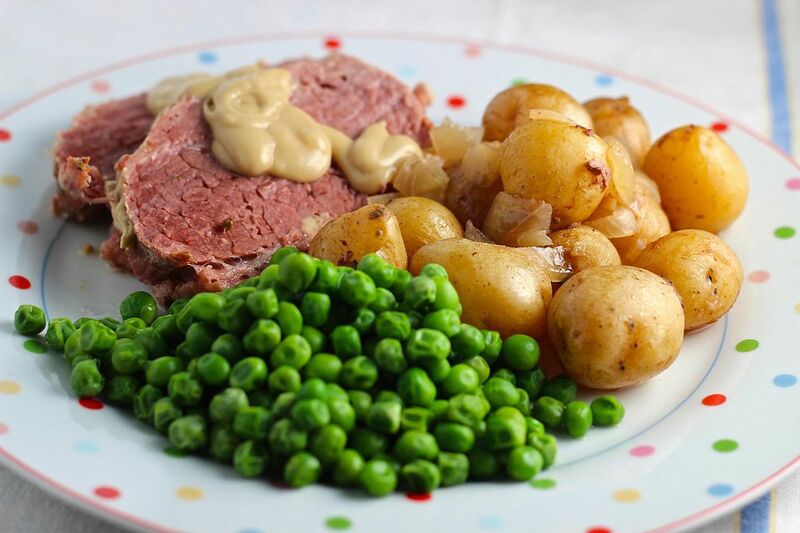 Corned Beef and Creamer Potatoes is a fabulously easy recipe to celebrate St. Patrick's Day. This twist on the classic Corned Beef and Cabbage is a nice change of pace. And because this is a slow cooker recipe it's so easy on you! The beef, potatoes, onions, and garlic cook to perfection in the slow cooker. Creamer potatoes are small and white, with thin skins. They become very creamy when cooked; thus their name! Just add peas, perhaps a nice green salad tossed with some grape tomatoes, and some homemade Irish Soda Bread for a complete and wonderful meal. ﻿Wash the potatoes gently; leave them whole. Place in 5 quart slow cooker with the onions and garlic. Top the vegetables with the corned beef and sprinkle with the seasoning packet from the corned beef. Pour the chicken broth over all. In a small microwave-safe bowl, combine the water, brown sugar, and vinegar. Microwave on high for 1 minute or until the sugar dissolves. Stir and pour into the slow cooker. Spread the mustard over the beef. Cover and cook on LOW for 10 to 12 hours or until the beef is very tender. Slice the beef to serve, scoop out the vegetables with a slotted spoon, and serve with the beef. You can save the liquid and freeze it for next year, or discard it. It's also good to use in soups, but it's a bit salty, so use your own judgement.